Mass Moca Delivers as Promised! Love. Mass Moca rocks! We got there when the doors opened (which was tremendous as they are closed on Tuesdays--but as it was school break week in Mass, they stayedopen this particular Tuesday). All the exhibitions we saw were unbelievable, inspiring and smart. The work in the Ahistorical show included a ballet inpired piece from Yinka Shonibare, some interesting work from Allison Smith, and a great series of giclees from Greta Pratt. 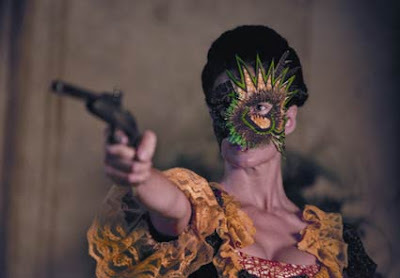 Un Ballo in Maschera (a Masked Ball) 2004 is Shonibare's first film. It presents the assassination of King Gustav III of Sweden in 1792 through the medium of dance. Costume highlights ambiguities of identity and gender, while the lack of dialogue and repetition of the action ask us to consider the conventions of narrative and the structure of film. Allison Smith, using many different craft types from embroidery, sewing, woodworking, calligraphy, pottery and costuming created a diversity of piece speaking of america. Her calligraphic piece which resembled the Declaration of Independance spoke to gay rights,gay parades and the position of gay people within the society. 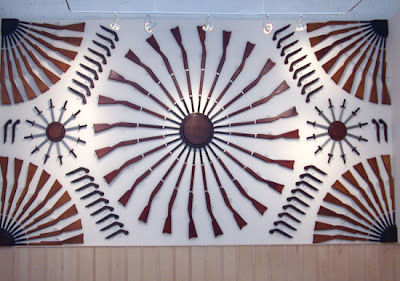 She created this extrodinary wall of wooden guns, swords and knives--hanging them as they are in the Governor's Palace in Williamsburg--in a series of circles and patterns essentially showing the power of the state in a decorative manner. 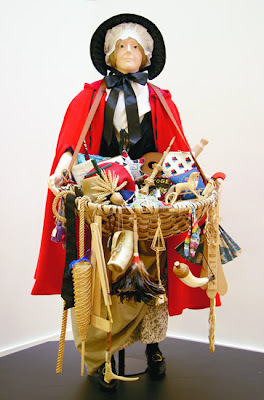 She created this wonderful mannikin--dressing it as a peddler woman with an enormous basket filled with embroidery, pottery, knit objects, woven straw objects to question aspects of american history (ie. a sampler of a teapot that said "Remember the Boston (teapot)" etc. Well done, well thought out. Simple and strong ideas. ALLISON SMITH, a Brooklyn-based artist, is interested in the notion of “authentic reproductions” – a common if oxymoronic phrase describing contemporary objects or tableaux that conjure historical aesthetics and episodes. In her sculptures and mixed-media installations, Smith investigates the ways in which a simple prop, bridging past and present, can come to signify more than its appearance suggests. She creates colonial handcrafts, Civil War memorabilia, and 19th-century weapons, often arranged to transform the exhibition space into that of a historic home or period room. For the past ten years, Smith has conducted an investigation of the cultural phenomenon of Civil War reenactment, or Living History, founded on the belief that historical events gain meaning and relevance when performed live in an open-air, interactive setting. Smith has appropriated the reenactor’s aesthetic palette to produce sculptural installations that examine the role craft plays in the construction of national identity. Over the summer of 2004, Smith organized a weekend encampment on the Catskills property of Mark Dion and J. Morgan Puett in which artists came together to create their own unique historical event. Emerging from that experience, the Muster on Governors Island is the most complex project she has undertaken thus far, broadening the Civil War metaphor to reflect on current events, and involving potentially hundreds of participants. Smith was born in Manassas, Virginia in 1972. She received a BA in psychology from the New School for Social Research (1995), a BFA from Parsons School of Design (1995), and an MFA from Yale University School of Art (1999). She participated in the Whitney Museum of American Art Independent Study Program (1999-2000). She has had solo exhibitions at Bellwether gallery (2002) and the Eldridge Street Project (2001); her next show at Bellwether opens May 26, 2005. Greta Pratt took photographs of men (19 to be exact) who looked like Lincoln and she dressed like Lincoln. There was a solid wall of framed giclees of these men that have likenesses--some closer than others, posed with the other worldly lighting...quite beautiful and believable. It poses the question of really, what did Lincoln look like given the Lincoln mythology and images that are out there. She also took a group shot of all the Lincolns together which was more amusing than serious which was a cherry on top for me. We loved the Ahistorical show with the few examples I have cited as just a taste of the intelligence and ideas floating around in this presentation. However, the Retrospective show of Huang Yong Ping was heart stopping and the "Rice Show" were even more noteworthy than this group. It is always amazing to me that this sort of work is continually challenging the viewer to think, compare, and sometimes laugh at things we may not address in our day to day existence. This work holds our interest and always invites you back for more. Mass Moca provides such a wonderful place for work and thought--we all need to support them in their efforts which are done so honestly, earnestly and cleanly to bring work like this to all of us and to be a singular economic driver for North Adams, Massachusetts. Huang Yong Ping for tomorrow.